Assassin's Creed: Odyssey is the biggest game in the franchise and the most in-depth yet. It combines role-playing elements with the parkour-inspired action we all know and love, and thus breathes new life into the 11-year-old game series. Superb. Ubisoft's Assassin's Creed series has barely had a break since its debut back in 2007. We've had at least one major release every year since, bar 2016 when the movie came out. But considering how massive 2017's AC: Origins was, and how groundbreaking a reboot for the series, we found it surprising that the French games publisher has managed to turn out another so soon. Worrying, in fact. Surely it couldn't rush out a sequel so quickly, not at the same level, at least? Not only has Ubisoft managed to follow up its 2017 Egyptian masterpiece with a capable peer, it has bettered it – delivering a bigger, bolder adventure that takes Assassin's Creed in a new direction. One that very much consigns the missteps of Unity and Syndicate to the distant past. Assassin's Creed: Odyssey is mammoth, in depth, scope and sheer size. The map is the biggest in the series, while the story is the company's most ambitious to date, giving players more control and options than ever before. Dynamic plots unfold as you make in-game decisions and multiple, branched endings can be uncovered - not just at the adventure's conclusion but even after individual missions are completed. It is a role-playing game in the traditional sense too, with customisation and player choice unprecedented for the series. It's also the first Assassin's Creed that gives you the option to play as one of two different characters from the get-go: Alexios, or his sister, Kassandra. In short, Odyssey is not just another Assassin's Creed, it's a marker in the sand for a very bright future for the franchise. 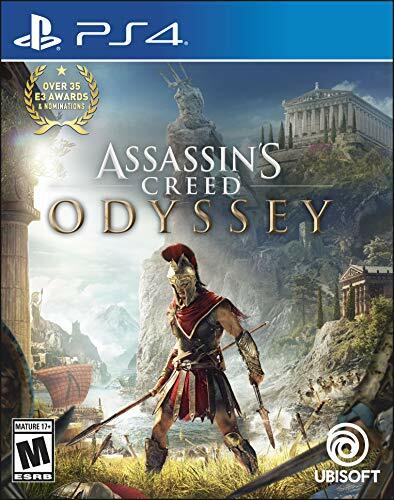 It started with Origins but has blossomed further and more rapidly in Odyssey. In many respects, the game doesn't initially feel like an Assassin's Creed. You can assassinate villains – and are asked to early on – but there's a distinct lack of the on-running Templar and Assassin thread until you get deep into the adventure. The Animus is back, and with it the nonsense in the modern world that has gotten in the way since Desmond Miles met his sticky end but, thankfully, those moments are few and far between. Instead, you are dealt an intricate plot of tragedy, reprisals and growth. No matter which character you choose, Alexios or Kassandra, both are Spartan born but cast out from their home for reasons you soon discover once the prologue period is done. And no matter your choice, the quest ahead is a long and complex one. There are memorable encounters with mythical and historical figures, some of which are breathtaking and inspired in their implementation. And all the while you really feel like you are travelling across the Aegean Sea to different islands and cultures. Indeed, that brings back a stalwart feature of Assassin's Creed since III first introduced it: ship sailing. Perfected in Black Flag it was ditched last time around – not least because Origins was largely set in the desert. However, the reintroduction of sea battles is much-welcomed round these parts and whets our appetites further for Ubisoft's forthcoming multiplayer pirate-a-thon Skull & Bones. Back to Odyssey, however, and another welcome return comes in the form of swimming. You can swim deep under the waves of the sea to discover shipwrecks and loot aplenty – another nod to one of Black Flag's most fondly remembered features. It serves to expand the map even further and add more playability and choice to a game already teeming in it. Combat certainly benefits from an expansion of choice. While it borrows the same engine as Origins – with light and hard attacks on the top right bumpers – this time you get a large selection of very different types of weapons to fight with, be it a sword, spear, daggers, mace or axe. Each has its own properties in terms of speed or damage. Plus, although you can upgrade your weaponry and add engravings to enhance their properties further, you can also find new, higher levelled versions scattered throughout the lands, including armour. This not only encourages variety in fighting styles and customisation, it rewards explorations – a massive trope in the game full stop. Exploration across the Greek islands in Odyssey is a must. It is the soul of the game and even pops up as an option before you start. You can choose to play it in its entirety like a traditional Assassin's Creed, with mission markers and quests easy to find and follow – thereby leading you on a reasonably linear path – or you can choose to play the game in Exploration mode. That way, mission objectives, locations and the like must be found. Sometimes that can be achieved through your eagle assistant, Ikaros, who acts much like his counterpart in the last game and spots enemies and points of interest from up above, and sometimes through chatting to non-playable characters (NPCs). That's another big change over previous games in the series and a big shout to role-playing games like The Witcher 3 and Mass Effect. Just about every time you speak to another person in the game you are given a dialogue wheel, with two or three things you can ask. Some add extra detail and therefore give you a better idea of where to find your next mission point, while others can change the story entirely. For example, early on in the game, during a side mission, we discovered a poorly family about to be slaughtered by a crew determined to wipe out the spread of the sickness. We were given the option to either let them die or stop their executioners by force. That is just one small case, there are many others and several massive ones that determine your path for the rest of the game. This is the scope that has surprised us, perhaps, but certainly delighted us. It would have been so easy for Ubisoft to churn out another run-of-the-mill Assassin's Creed game and, as fans, we would have probably still lapped it up. But AC Odyssey is so much more than another excuse to freerun across the rooftops of yet another historical location. It is involving, in-depth and a new direction for a franchise that showed a promising resurgence with Origins. It is now firmly back at its best. That's surprising, given it's been less than a year since the last, but it's the truth. It is graphically stunning too, much like the last outing, in both 1080p and 4K HDR on Xbox One S and One X respectively. And even its one caveat - shonky facial animation during moments of dialogue - is entirely forgivable when its sheer size is taken into consideration. In Assassin's Creed: Odyssey, Ubisoft has created a genuine contender for game of the year. It's a Greek classic in every sense. Sparta-cular indeed.